Helping You Explore Italy's Best-Kept Secret — South Tyrol! You can be forgiven for thinking driving in Italy is madness. Nearly every Hollywood depiction of an automobile in Italy involves a whole lot of speed fueled by sheer chaos. Just three minutes into Quantum of Solace, James Bond has all but destroyed a $250K+ Aston Martin while simply trying to roll into Siena. Don’t let Hollywood fool you. ANYONE with a dose of common sense, a little pre-trip prep and a solid GPS can easily handle driving in Italy. If you like the idea of freely exploring Italy’s countryside, vineyards, villages and Alps at your own pace, a car is a must. With a car, nearly all of Italy’s off-the-beaten-path jewels will be yours for the picking. And trust us, hidden gems such as Italy’s South Tyrol region are not to be missed. Pressed for time? Then download our FREE “Driving in Italy Checklist”. It helps ensure you’re ready to handle Italian roads like a pro. One of the top questions we receive about driving in Italy is which side of the road do Italians drive on. Good news for some. Italians drive on the same side as the U.S. and much of Europe. Yup, the steering wheel is on the same side as well. If you were fretting making a mistake on the road due to it being different in that respect, your biggest mental hurdle to driving in Italy is behind you! By law, Italy requires foreign drivers to possess an International Driving Permit (IDP). This document translates your driver’s license into a format that allows authorities to easily identify you. Obtaining an IDP is easy, cheap and needs to happen before you head to Italy. Don’t worry. You do not need to pass any test. The U.S. State Department has authorized only two entities to issue citizens IDPs: American Automobile Association (AAA) and the American Automobile Touring Alliance (AATA). To apply, go to one of the above links and print out the application form. You’ll also need two original passport pictures (easily available at places such as Walgreens), your valid driver’s license and $20 for the permit processing fee. If you visit a local AAA branch office you can obtain your IDP within 10-15 minutes. If you choose to apply via the mail allow 4 to 6 weeks so plan accordingly. Once issued, your IDP is valid for 1 year. To get the best deal when renting a car in Italy, conduct online research using a consolidator site such as Kayak or Auto Europe. Reserve a car before you depart on your trip. With these sites, you can browse multiple car rental options and easily sort by the best price and features. We’ve had the best luck renting through Auto Europe. They offer the most affordable choices, never add hidden fees and provide 24-hour assistance in English. In addition, Auto Europe provides free winter tires, which is required in some parts of Italy if you’re traveling between November 15 – April 15. Rental car options in Italy default to manual transmission so unless you like cruising around with a stick shift be sure to select automatic transmission when searching. You’ll pay a bit more for an automatic, but the cost is worth it. A small, compact car in Italy gives you the most flexibility to get around. When it comes to vehicle size, we always opt for a smaller vehicle such as a Fiat 500. Sure with a smaller car, your odds of looking like a man of international mystery are slim to none, but they are the most budget-friendly. Plus, they allow you to dart down narrow medieval alleys and park with relative ease —something that is especially critical when visiting Naples and other cities brimming with antiquity. 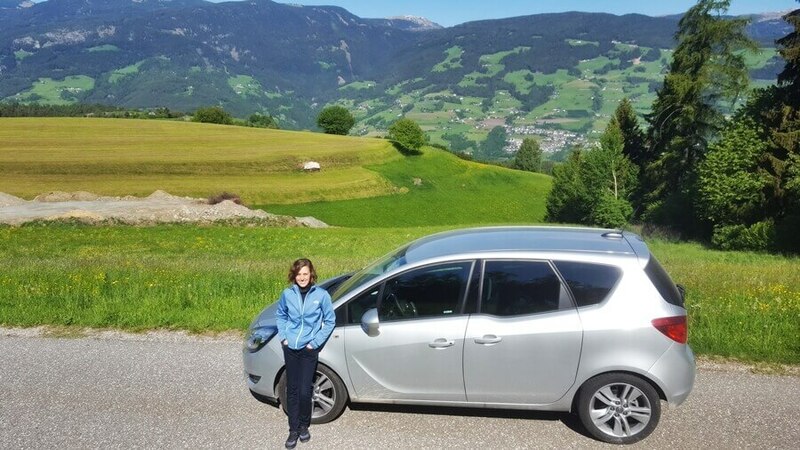 The compact vehicles we’ve rented have never had an issue handling mountain roads in the Italian Alps or Dolomites. However, if you plan to visit Italy’s mountainous gems in the winter, we recommend renting an SUV. 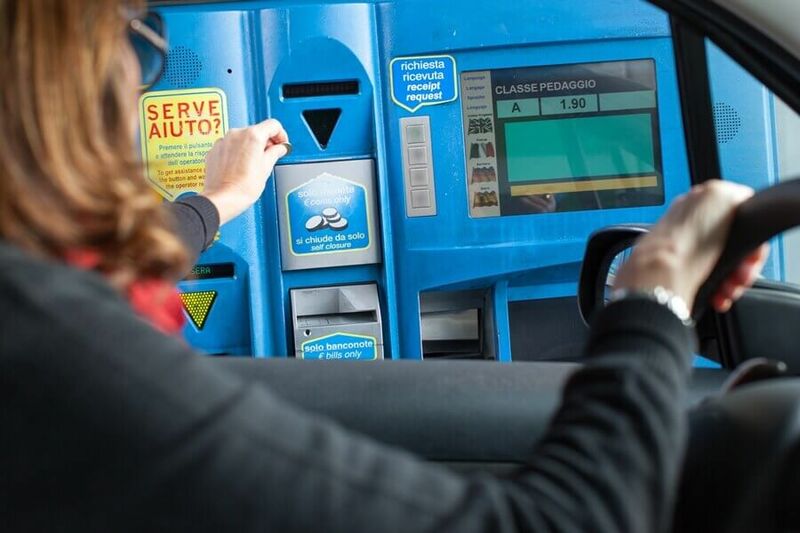 To save money with your car rental in Italy, pick it up and drop it off at the same location. For us, this means we book our flights in and out of the same airport. If you drop it off at a location other than where you picked it up, you’ll likely pay a premium. Check out these tips for finding the best flight deals. With regards to car rental insurance, the car rental company should include basic, mandated liability coverage for damage to anyone or anything outside the car due to an accident. Italy also by law automatically requires renters to pay for collision damage waiver (CDW) and theft protection. This is not an add-on and will be included in your car rental rate. By having CDW insurance the car rental company waives the right to collect a high deductible from you if the car is damaged. This greatly reduces the deductible you would owe if you’re in an accident or damage the car. It also covers most of the car if you are in a collision. We do not purchase extra insurance as a part of our car rental agreement. Instead, we include it with our trip insurance plan, which we purchase in the event we need to cancel our trip. If you don’t typically purchase trip insurance, we highly recommend it for added peace of mind. To compare the best trip insurance plans, we use InsureMyTrip. It’s fast and convenient. Some credit cards include car rental insurance as a benefit, but make sure it covers countries such as Italy. Review the complete description of the coverage offered by your credit card company before relying on it. Odds are your rental car in Italy can come with a GPS navigation system built-in for an additional cost, but we recommend using a standalone unit and bringing it with you. Why? Few things are more frustrating than trying to program a GPS system when you’re jet-lagged and its default language is Italian or German. Unless you’re fluent in either language, save yourself the headache by programming destinations into your own GPS unit before you depart. That way, when you pick up your rental car you can simply power it up and be on your way. If you don’t own a GPS unit, you can buy a used one cheap by searching on sites such as Craigslist. However, if you like the latest and greatest gadgets we recommend going with the Garmin Nuvi. This device is intuitive to use and has never failed to get us to our destination even when we were stubborn and wrongly thought we knew a better way! When in doubt, trust your GPS. 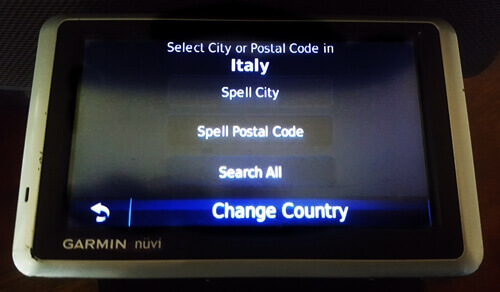 No matter where you purchase your GPS make sure it is loaded with maps covering where you intend to visit in Italy. For our trips to South Tyrol, we purchased the Garmin City Navigator 2016 Northern Italy Map microSD Card. This GPS map is very comprehensive and features motorways, national and regional thoroughfares and local roads throughout Northern Italy, Germany, Austria, Switzerland and more. You can certainly attempt navigating Italy the old fashioned way with paper maps, but if you’re off-the-beaten-path or in a busy part of a city it can be nerve-wracking to decide your next turn. Do yourself a favor and invest in a GPS. You will not regret it. It’s worth noting that if you intend to visit areas of Italy where you are confident there will be cell phone reception and you have an affordable international cell phone plan, Google Maps can be a viable alternative to a GPS. Italians are competent and decisive drivers. By knowing the basic rules of driving in Italy, you can hold your own behind the wheel. Just recognize that they will rule the road. And that’s just fine. When traveling on multi-lane highways such as Italy’s autostrade, only use the left lane if you are passing. Just like in the U.S., the left lane is not the place to act like you’re on a Sunday drive. But unlike in the U.S., cars can come up behind you at incredible speeds on a regular basis. The best thing to do is just get out of their way by keeping to the right. Even though Italians drive fast, all roads in Italy do have speed limits. On country roads the speed limit is 90 km/h (56 mph), on freeways it is 110 km/h (68 mph) and on the autostrade it is 130 km/h (81 mph). Your best bet is to obey the posted speed limit signs, but apply common sense. Go with the flow of traffic. We always do so without issue. However, it’s worth keeping in mind that Italy does extensively monitor speeds with highway cameras and will issue fines that hit you through your car rental company. Use roadside mirrors when approaching corners while driving in Italy. Stop signs and stop lights operate the same in Italy as the U.S.; however, it is always illegal to make a right turn at a red light in Italy. Many other road signs you’ll encounter driving in Italy are intuitive and universal. But some can be confusing so it’s worthwhile to familiarize yourself with the most common. 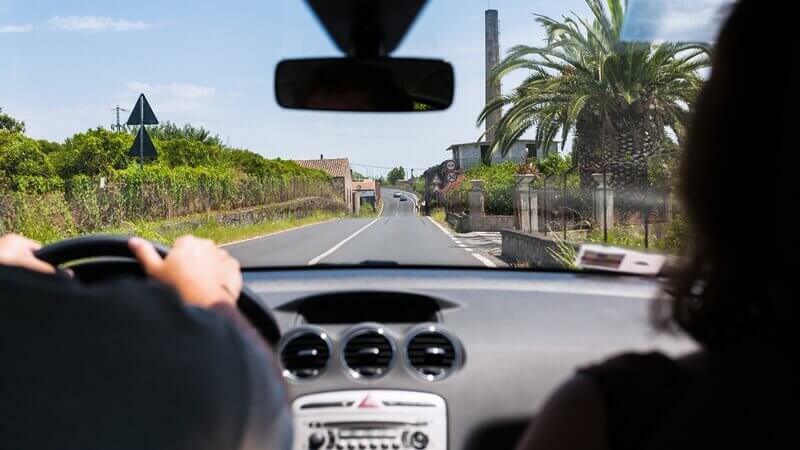 We’ve developed a handy Driving in Italy Guide – Cheatsheets that you can download to your phone, tablet or print out for easy reference when you’re in your car. We use this guide on every trip to Italy and have found it a true stress reliever for the times when you get flustered on the road and can’t recall a specific rule, sign or guideline. Italy has no shortage of narrow, winding roads. 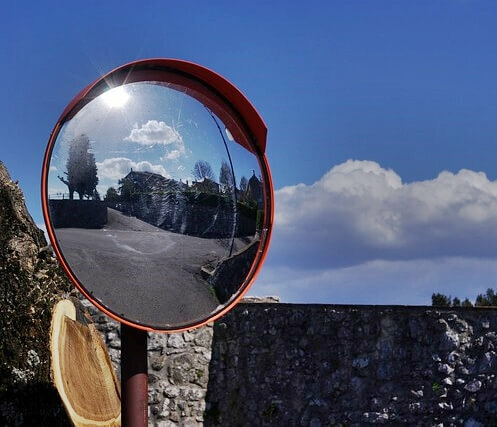 To help you see what may be coming ahead, mirrors are often posted on the side of the road by corners. Get into the habit of using them to avoid potential problems. Italy’s autostrade (autostrada – singular) are toll highways that require taking a ticket to enter and then paying at drive-up toll booths upon exiting, which happens when you pull into a city, town, etc. (gas stations are conveniently located right next to the autostrade so you do not need to exit to fuel up). Even though you have to deal with tolls, the autostrade makes driving in Italy efficient — allowing you to quickly get from destination to destination. Entering the Autostrade – Select a lane with a white sign with the word “Biglietto” (ticket). When you pull up, grab the ticket from the machine. The toll bar will automatically rise to allow you to be on your way. The lanes with yellow signs are for residents who have a Telepass, which allows them to zip through the toll without taking a ticket. Exiting the Autostrade – When you pull up to the toll lanes to exit the autostrade you will see multiple options. As a tourist, you’ll want to select either the lane with the white sign showing a hand with a cash symbol or the lane with the white sign and cash symbol along with credit card symbols on a blue background. The lane with the hand symbol indicates there is an attendant who will take your ticket and handle the transaction. This lane is cash only. 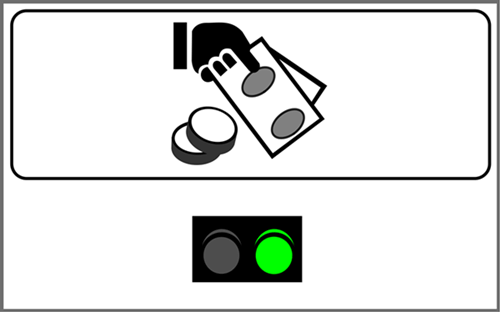 The lane with the cash and credit card symbols is a self-service lane where you insert your ticket in the machine as indicated and then insert a credit card or pay by inserting cash or dropping in coins. The machine dispenses change if necessary. The type of credit cards accepted is chip cards (most U.S. cards now have chips) from American Express, Visa or MasterCard. We typically pay with cash or coins in either lane, but have also used our credit cards without any issues. Entering a PIN is not necessary when paying by credit card. Pay Autostrade tolls with cash or a credit card. Planning Your Trip on the Autostrade – Before leaving for Italy, it’s worthwhile to map out your road trips to determine if you’ll be using the autostrade and how frequently. It’s also helpful to see if there are viable alternative routes where you can avoid tolls. The tool we use is ViaMichelin. ViaMichelin calculates estimated driving times, fuel costs as well as toll costs. It’s worth noting that Sundays are a good time to drive on the autostrade as semi trucks are prohibited. Buckle Up – Everyone in the vehicle must wear seat belts. Headlights – Headlights are required to be on at all times. Drinking & Driving – Italy has a 0.5mg blood alcohol limit for drivers. A glass of wine or two can put you over the limit. Watch what you sip or ensure you have a designated driver. Children – Leave them in the U.S. (just kidding!). Children under the age of four must be secured in an approved child safety seat. Kids from 4 to 12 must be in a child restraint if they are riding in the front passenger seat. Emergency Accessories – Italy requires each vehicle to have a visibility vest for every occupant, as well as an emergency triangle in the vehicle. Your rental car company should automatically include these in the vehicle, but it’s worth double checking with the agent at the pickup counter. If you forget and need to purchase a vest, they are readily available at gas stations and are inexpensive. No, you do not need to wear these while driving! Just put them on if you pull over to the side of the road and get out for any reason. Mobile Phones – If you plan to use your phone while driving, make sure you use a hands-free device. If you plan to text while driving, you are stupido. Zona Traffico Limitato or ZTL – When driving in a city or town do not enter areas with a sign that says Zona Traffico Limitato (ZTL). These are car restricted areas such as city centers and plazas. Some ZTL areas capture your license plate number with a camera and you’ll receive a hefty fine if you mistakenly enter one. The fine will find its way to your credit card through your car rental company. Right of Way – At intersections, vehicles approaching from the right always have the right of way. Parking in Italy can look like a plate of spaghetti. But knowing your options and what to keep an eye out for will make you much more confident. Often you can locate free parking outside of towns and cities and take a shuttle to the center. This is ideal to avoid driving in a major city. It can be incredibly hectic…especially when you do not know the language or the local unwritten rules of the road. Plus, driving in a major city in Italy is really unnecessary due to excellent public transportation options. But if you do need to enter a city we have always been able to find convenient pay lots with the help of our GPS. These lots are straightforward and operate very similar to those in the U.S.
You take a ticket from a machine when you enter a pay lot. Bring the ticket with you when you leave the car as you’ll insert it into a pay machine before leaving. After you’ve inserted the money, the machine will spit the ticket back to you. Keep the ticket as you’ll need it to exit the lot. Blue lines indicate you can park and make a payment at a nearby pay machine. When parking on the street white, blue and yellow lines designate parking places. White lines in most cases indicate free parking, but that can depend on the city so you’ll want to make sure it’s not permit parking only. Blue line parking spaces require payment at a pay machine. These spots require payment from 8 AM to 8 PM except Sundays and holidays when they’re free. Yellow markings are for authorized drivers only, such as the handicapped. If you’re not sure about a parking space, just move on until it’s clear to you. The last thing you want is to have your vehicle towed. During our visits to Italy, we have never had a roadside emergency such as running out of gas, a flat tire, fender bender, etc. That said, it pays to know upfront how to handle such scenarios in case they happen. When selecting which company to rent your vehicle from, make sure they offer 24/7 assistance. For example, Auto Europe prides itself on giving you peace of mind throughout your trip no matter where you decide to roam in Italy. If you need assistance, simply contact their support number at any time and follow their directions. 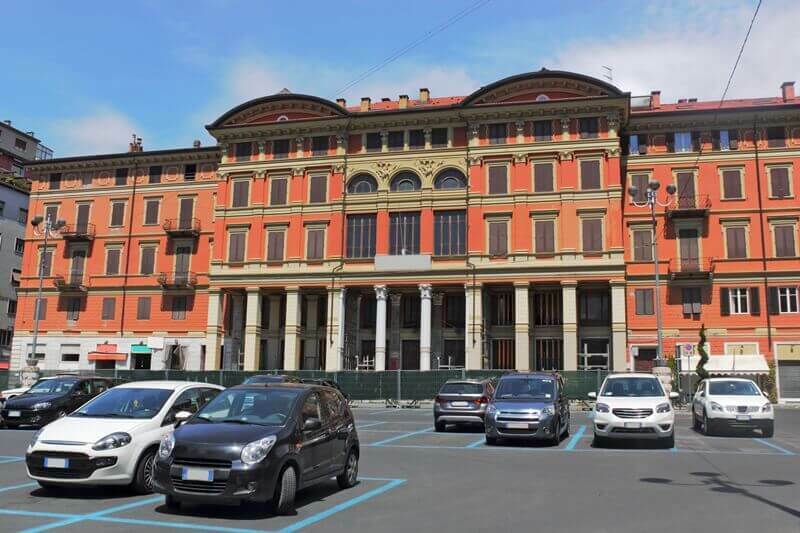 Another option is to call the Automobile Club D’Italia (ACI). The ACI provides 24-hour roadside assistance with English speaking operators to all drivers in Italy any day of the week. Contact ACI anytime by calling 803.116 from a landline or 800.116.800 from an international number. The ACI offers tows and roadside service without requiring you to be a member. If you are unable to connect with your car rental provider or the ACI, it’s comforting to know that all major motorways in Italy have emergency phones located every mile. If you need mechanical assistance or emergency help, these phones will connect you with an emergency center. Most Americans vacationing in Italy will never rent a car. As we previously stated, that’s just fine if you’re only venturing into the major cities. But if you’re like us and want to devour all of Italy’s natural, cultural and historical nooks and crannies don’t let anyone talk you out of renting a car. Yes, you may get lost for a bit or make a mistake that annoys another motorist. So what. Being anxious about driving in Italy for the first time is normal. But with this post and a little pre-trip prep following our FREE “Driving in Italy Checklist” you will be cruising Italian roads with ease in no time. And if you are ever driving in Italy and discover the “steering wheel was screwed on backwards”, don’t sweat it. You’ll wind up in good hands and may just find yourself right at home in Italy. Right where you belong. Enjoying the simple and the beautiful. WAS THIS ARTICLE HELPFUL? TAP TO SAVE! Please note that some of the links above are affiliate links, and at no additional cost to you, we’ll earn a commission if you make a purchase. This allows us to keep Throne & Vine up and running so we can continue to bring you Italy’s best-kept secret. Our opinions and reviews are always 100% authentic. Hi, We're Kate & Vin! And we're on a mission to help you discover and explore Italy's Best-Kept Secret! FREE South Tyrol Travel Resources. You have successfully joined our list. Check your inbox for how toaccess our South Tyrol Resource Library. BRING THE ALPS INTO YOUR HOME! Start Your South Tyrol Adventure Now…Follow Us!